Tiger Woods acknowledged the gallery after winning the PGA Grand Slam of Golf on Kauai yesterday. POIPU, Kauai » Tiger Woods overcame his erratic first round by shooting a 6-under 66 yesterday to overtake Jim Furyk for a record seventh victory in eight tries in the PGA Grand Slam of Golf. Woods, who trailed Furyk by three shots going into the final round, finished at 8-under 136 for the $500,000 top prize at the Poipu Bay Golf Course. Furyk shot 1-under 71 yesterday and wound up two strokes back, but still pocketed $300,000 in the tournament that tries to bring together the year's four major winners. "I certainly hit it better than I did yesterday," said Woods, who played poorly on Tuesday, when he managed to shoot 2-under 70. "I was able to get Jim's three-shot lead down to one after the first three holes and that was ideal. I kept trying to put the pressure on Jim. He played solid, very consistent." It might be Woods' last hurrah on Kauai. Negotiations are ongoing with Poipu Bay and other sites, including Las Vegas and Bermuda, for the tournament rights in 2007. After whittling down Furyk's lead with birdies at the par-5 second hole and the par-3 third, Woods catapulted himself into a tie at 6-under on the par-4 ninth by chipping in for birdie from just off the green, up a steep slope. That shot energized Woods for his final thrust to victory, and when Furyk two-putted from 5 feet for bogey at the par-4 10th hole, Woods had the lead for good. Woods, the British Open and PGA Championship winner, scrambled to save par on the 10th and the par-3 11th to keep the lead. "The two up-and-downs on 10 and 11 were key to start the back nine," Woods said. "I felt like I had the momentum back on my side. After chipping in on 9 and I didn't want to give it back to him." Still, Furyk -- who qualified as an alternate -- was in striking distance all the way to No. 18. But he blew a chance to stay within one shot at the par-4 15th when he missed a tricky, downhill 6-footer for birdie and Woods went up by two strokes at 7-under by making an uphill 12-footer. "I was, of course, hoping to get a birdie there," Furyk said. "He hit a good putt, knocked it in the middle. Looked like it was going in from the time it left the club. I misread mine and got it a touch left. It was probably one of the worst putts, worst chances I gave myself this week because I did hit a lot of good putts. That didn't do me in, but (Tiger) being up 1 there or 2 is a big difference. (The caddie) read it as a left edge putt and I was kind of thinking the same thing. It was probably more of a left-center putt." Both Furyk and Woods birdied the par-5 18th before Woods accepted the winner's trophy. His other victories here came from 1998 to 2002 and again in 2005. The only blemish was a three-shot loss to Ernie Els in 1997, Woods' rookie year on the PGA Tour. Woods also came back from a two-shot deficit to beat Vijay Singh in 2000. "They're going to rename it the Tiger Woods Trophy," PGA of America media relations director Julius Mason joked. 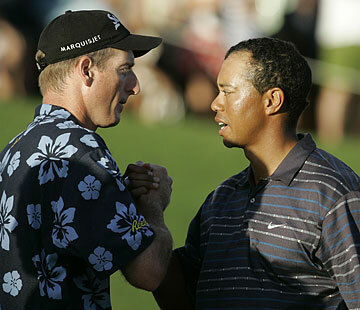 Jim Furyk congratulated Tiger Woods yesterday after Woods won the Grand Slam of Golf on Kauai. U.S. Open Champion Geoff Ogilvy, who struggled mightily with his putter, earned $250,000 for his third-place finish at 2-under 142. "The greens are really, really, really (slow)," Ogilvy said. "I grew up on bent grass. I've played enough Bermuda (which Poipu Bay has) to know it's slow. These are especially slow into the grain. It's just hard to get myself to hit it that hard. At the Australian Open, if I hit some of those putts that hard, I would have been bouncing the ball off the shins of the people in the front row." Mike Weir, who also qualified as an alternate, struggled for the second straight day, but earned $200,000 for last place at 1-over 145. He hit it into a water hazard on the par-3, 179-yard seventh hole, where he wound up with a triple bogey. He also found water on the 312-yard par-4 13th and escaped with a bogey. "Hitting it in the water is not fun," Weir said. "I had a good number (9-iron) on No. 7, just hit it a little heavy. Then I seemed to catch that little rain squall trying to drive the green on No. 13." The rain started at No. 12 and ended before the players teed off on No. 14. For Furyk, who won here in 2003 when Weir placed second, it was a day where he almost got it done. "I'm not extremely happy with the way I played today," he said. "I scrambled well and got up and down well and putted pretty well for two days, but I didn't putt nearly as well as I did yesterday. I managed to go through 36 holes only making one bogey, so I did a lot right." Woods never thought he had the tournament in the bag until the end. "The only time I really felt like I pretty much had everything under control is when Jim didn't hole his third shot on 18. I figured I could three-putt from there and be OK."
A brilliant rainbow appeared over the Pacific Ocean behind the 13th tee yesterday. Maybe it was an advertisement to keep the tournament in Poipu instead of moving it elsewhere. In the post-event interview Wood reiterated what he said last year about Kauai and how he loves coming here. "This has been basically like one of the great vacations for us players to come here," he said. "The resort's fantastic. The people that come out and watch, support, there's just genuine people. I've always loved coming here. It's just a shame that if it doesn't happen again, we don't come back. But first thing's first. I've got to qualify. I've got four chances next year. We'll see." Woods doesn't know what his schedule is going to be like next year, yet. "As far as next year is concerned, I really don't know yet. I don't know what the order of events are yet, to be honest with you. I haven't looked at the schedule yet. I was just trying to get through this Asian (and Hawaii) trip here, then get on my vacation here, start thinking ahead to that, start planning my schedule and practice time."